"Usually I'm introverted, but volunteering at classes has been a good way to talk to people." Made In Hackney founder Sarah Bentley chats to ace volunteer Jamie Pallas about his experience supporting our bread teacher Tim Aldridge (of Bread Club Hackney) to lead our first ever four week community bread making course Daily Bread in partnership with MHDT on the Woodberry Down estate. Sarah: How have you found your experience volunteering for Made in Hackney? Jamie: I love volunteering for MIH. I feel that I learn as much from the classes as I contribute. I get a real buzz after every class I volunteer at. The community classes have a collaborative feel and it's great to get to know people from a range of backgrounds. 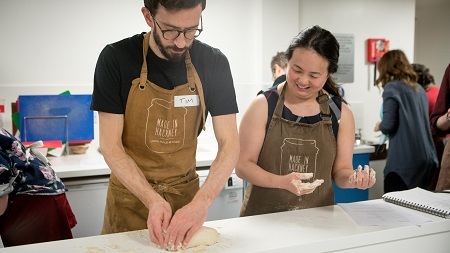 I've found that participants often know a lot about food from different cultures and it's great to see a group of people working together to perfect a dish - or loaf of bread. The creativity of the class teachers always produces amazing plant-based recipes that I always want to make myself at home. Sarah: Did volunteering at the Daily Bread course improve your own baking skills? Jamie: Yes. I feel that the Daily Bread course definitely gave me more confidence to try bread baking at home. The course gave me knowledge about what to look for at each stage of the bread making process and I learnt new kneading techniques. Sarah: As a result of volunteering with us are you doing something new in your day-to-day life? Jamie: Yes I am. As a result of volunteering I have made much more bread from scratch at home. I have realised how cost effective it is to make your own bread, and that even if it doesn't turn out perfectly, it still tastes better than most shop-bought bread. Sarah: Did volunteering for the Daily Bread course enhance your connection to the local community? 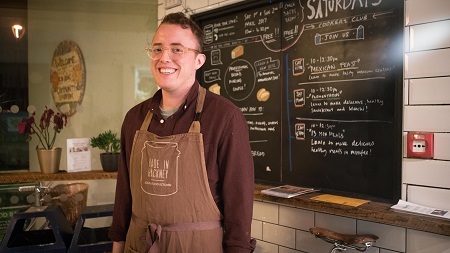 Jamie: Volunteering for the Daily Bread course was a great opportunity to meet a range of different people from the local community who I might not have the chance to meet in everyday life. Everyone who participated in the course brought their own knowledge and experience of cooking and was willing to share their ideas. It was great. Sarah: Have you gained any new skills by volunteering on this course? Jamie: During my daily life I have a desk-bound job, so it was great to do some more active volunteering and meet a new group of people. I felt more confident after each session as I am usually introverted, so volunteering at the classes is a good way to talk to people about something I am passionate about. Volunteering at MIH has already improved my knowledge of baking (and fermenting) - it would have been difficult to gain this in person without taking a course myself. Sarah: Any unexpected benefits about volunteering on the Daily Bread course? Jamie: It was great to meet the class teacher Tim and learn more about how he set up his own part-time bakery. It has inspired me to follow my own ambitions in food. Sarah: Finally did volunteering with MIH improve your mood? Jamie: Yes it did. I felt great after volunteering each week! I don't often get the chance to cook with a group of people, so it was great to work in such a social setting. I enjoyed helping others build their confidence in baking. I felt like I'd contributed to something really positive at the end of each class. Sarah: Thanks so much Jamie. We couldn'r run our programmes without our amazing volunteers so big up yourself!